The HTL8259 is a synchronous implementation of the industry standard 8259/8259A Programmable Interrupt Controller (PIC). The PIC can be used to extend the number of interrupt lines on a microcontroller/processor. Although the PIC is normally used in an x86 design, the VHDL source code can easily be modified to adopt to a non-x86 style microcontroller/processors. The HTL8259 provide a wide range of vectored interrupt handling and ternination modes. The controller can be programmed for fixed, priority and polled mode of operation. Interrupt inputs can either be level or edge triggered. 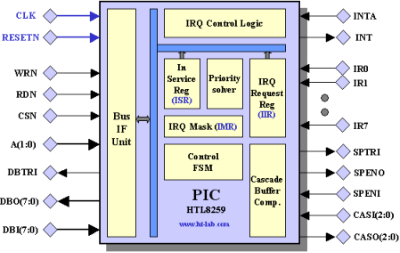 A single HTL8259 controller can handle up to 8 vectored priority interrupts. Without any glue logic multiple HTL8259 can be cascaded to provide up to 64 vectored priority interrupts. This number can further be increased by using the Poll command. The HTL8259 is delivered in vendor neutral VHDL and can be synthezised for a wide range of FPGA/ASIC's. There are a number of differences between the original 28 pins VLSI device from Intel and others and the HTL8259, • Due to the synchronous nature the HTL8259 requires a clock and reset signal. • Two additional signals are available to control top level tri-state buffers for the databus and cascade signals. • The HTL8259 has not been validated for the 8080 and 8085 processors although the logic for the 3 byte call sequence and register settings are available. The HTL8259 is delivered in synthesizable vendor neutral VHDL source code. The source code is fully documented and can be synthesized using any modern synthesis tool. 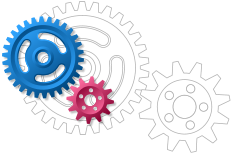 A self-checking VHDL testbench is included which partly verifies the different operating modes. For evaluation the HTL8259 can be supplied on a low-cost FPGA development board from Enterpoint Ltd. The HTL8259 is instantiated in dual cascade mode together with an HTL80186 processor, the HTL16550 UART, a Real Time Clock, the HTL8254 Timer unit and 40Kbyte of SSRAM. No VHDL source files will be supplied in this case, just a bitstream.